Talk about Catch 22 ;) Anyway. My Mom arrived up from Cape Town on Thursday afternoon. The Trucker & I took her to dinner at Col'Cacchio which was nice - I don't know if you've noticed, but our eating out has slowed to a near halt. Haha. I'd taken the day off on Friday and after a lazy-ish morning, Mom & I headed back to Lanseria to collect The Peeb who also came up for the weekend. 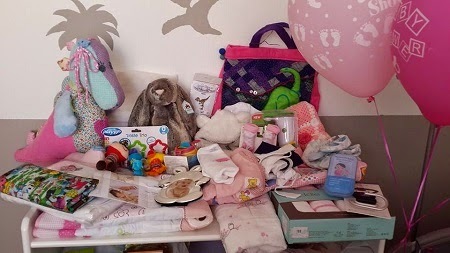 From there we did a whirlwind shop for Baby Shower provisions. The Trucker got taken out by a couple of his friends on Friday evening to celebrate the baby too :) While Mom, Peeb & I stayed in and ate Indian take-out (that was the last time for me ... I rather suffered. The heart-burn / acid reflux seems to have escalated! Bugger). On Saturday morning we were up early and then headed to @clairam's house for my Joburg Baby Shower. It was a bit chaotic to start ... we were running a little late and still trying to get everything ready as people arrived. But it was a lovely morning. The food was delish, although we rather over-catered. 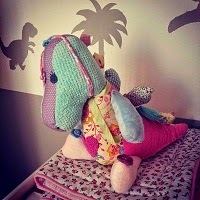 The Trucker's sister had a soft Dinosaur toy custom-made for The Babe. Seriously it's awesome! And she got a Jellycat bunny rabbit! I am not yet sure if I'll even tell her that one was for her haha, it is so soft. And a bunch of my lovely friends all donated to pay off the remainder of our Maternity & Newborn photo shoot with Little Black Box! Once again, we were so completely spoilt. Although my mom did find it amusing how little we got in the way of practical gifts these days ... apparently that was what it was all about back in the day. Next weekend will be our big practical shop ... for her and me! I pretty much only have TShirts and dresses right now, which are not ideal for trying to breast feed. And she only has 4 packs of nappies (and 1 is prem, so we'll likely have to swap those when she goes over 2.5kg ... she was 2.1kg last Wednesday!) and 4 outfits for 0-3 months! On Saturday afternoon we all napped! It was much needed. And then we decided to head to Cedar Square for sushi for our last dinner all together. On Sunday morning The Trucker headed to an early cricket game and I took Mom & Peeb back to Lanseria. Awe, next time we see them we'll be parents! Yoh. On Sunday afternoon we headed to @WhizBangLouLou's for a housewarming braai. So good to catch-up. And then the rest of Sunday was spent on the couch ... exhausted. Yep, definitely need to slow down now. Getting close now, I feel excited! I get so excited now for other people as the time approaches now that remember this time. I also remember that in the last few weeks of pregnancy I was so sore and uncomfortable that no matter how scared I was of giving birth I was desperate for it to happen so that I could stop being pregnant.